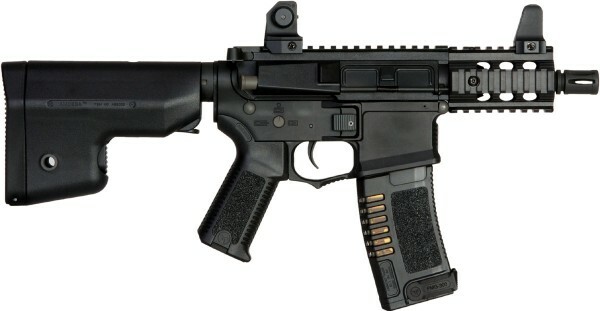 ARES - Amoeba AM-007 M4 - Stubby Version is a lightweight super CQB length M4 AEG rifle. Comes with a 3.5'' metal front end, perfect for attaching flashlights, lasers, PEQ box and any of your other accessories! This Airsoft gun comes with a quick change spring system allowing you to quickly upgrade or downgrade the FPS (Feet per second) rating of the gun with ease. 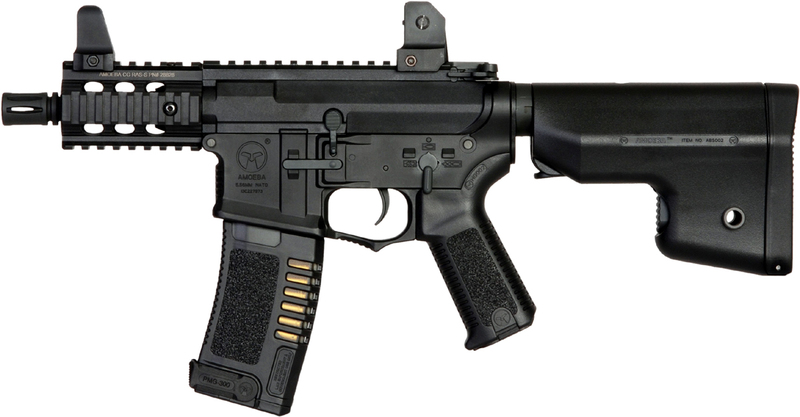 This AMOEBA style rifle is part of ARES's new EFCS gear box system (Electronic Firing Control System), which allows the gear box to be programmed to be Semi, 3 round burst or full auto using the Ares Amoeba Electronic Gearbox Programmer EFCS. The new EFCS gear box system means the AEG rifle comes with an electronic trigger, meaning an even quicker trigger response!